I've been struggling with acne and oily skin with enlarged pores for 15 years. Over the years I've lost my self-confidence, and have hidden behind a hanging head or an overload of makeup to get through each day. Since I discovered Memebox, I've really stepped up my skincare game, with an overall goal to get my skin to the point where I can where my usual eye and lip makeup, but eliminate the pore-clogging foundations I've previously been chained to. Granted some foundations are better than others, but all of them I've tried cause me to break out in one way or another. I've always lived under the mentality that "less is more" and assumed that if I used too many products it would aggravate my skin and make my acne worse. It wasn't until the past few months that I was introduced to Korean skin care products, and (more specifically) Memebox. I jumped into the Memebox craze and started ordering every box that sounded like it might help my skin in some way, and hoped for the best. Soon I found myself with boxes of cleansers, toners, moisturizers and sheet masks. While trying to find the perfect combination of products to use, I happened upon an article about layering. Layering would literally solve almost all the problems I was having with conflicting thoughts I had about the ever-growing mountain of skin care products I had in my bedroom, so I immediately started layering products morning and night. While using several of the same types of products that offered different benefits to my troubled skin, I quickly found my skin taking advantage of everything, and slowly clearing up. Over the course of about a month I noticed my cystic acne started disappearing and soon I was experiencing fewer whiteheads and my blackheads were fewer as well. 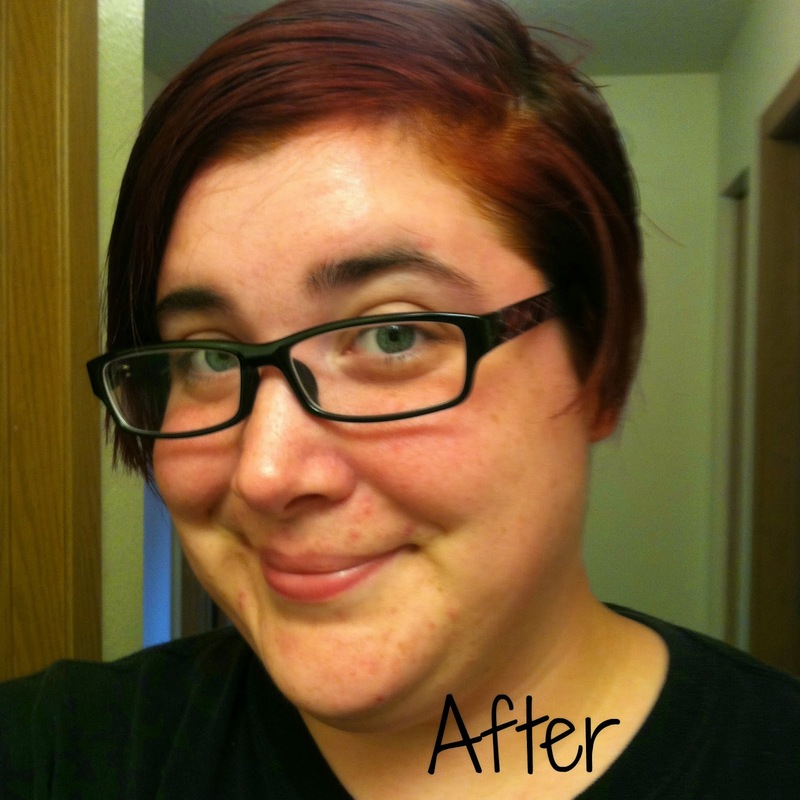 While I still experience the occasional whitehead (especially around "that time of the month") and my blackheads have not exactly disappeared, I have been wanting to scream from the rooftop to all of those who feel self-conscious about their acne as I do and share with you the mile-long routine that literally transformed my skin into something new. Each post will cover products from a new category that I use either in the morning or the evening, and will feature the tag "skin care routine" so they are easy to follow. I thank you for following my journey and I hope that the info to come will help someone else as much as it has helped me. This box with all of its components revealed from the very beginning is dedicated to you girls out there who feel a little bit shy or hesitant in trying out our our beauty boxes. Nakedbox #23 includes items perfect for traveling! It will insure you bring all travel essentials in your pouch. This mask hydrates and moisturizes your skin to the fullest. It’s a 100% coconut jelly mask, which gives your skin a cooled feeling. It also dramatically reduces any signs of wrinkles! Sprinkle a small amount into the palms of the hands. Press gently into the skin of the face until the essence has soaked in. This cooling pore mask reduces the appearance of enlarged pores, helping to keep them purified, refined and smooth. Enriched with strawberry, raspberry, blueberry and acai berry extracts, it also delivers intensive nourishment deep down into the dermal layer. Upon application, it delivers a cooling sensation to the skin as it contracts pores, and cleans out gunk and oil that are trapped underneath. It also contains proprietary mineral complexes that help to tighten and minimize the pores for flawless skin. After cleansing the skin, apply a thick layer of the cream onto the skin. Wait 10 to 15 minutes and you will feel a cool warm tingle across your skin. Thoroughly rinse with lukewarm water. This Pore Tightening Serum leaves skin feeling silky smooth skin and shrinks and refines enlarged pores, all while providing skin whitening, and lifting and firming properties that improve the skin’s elasticity. 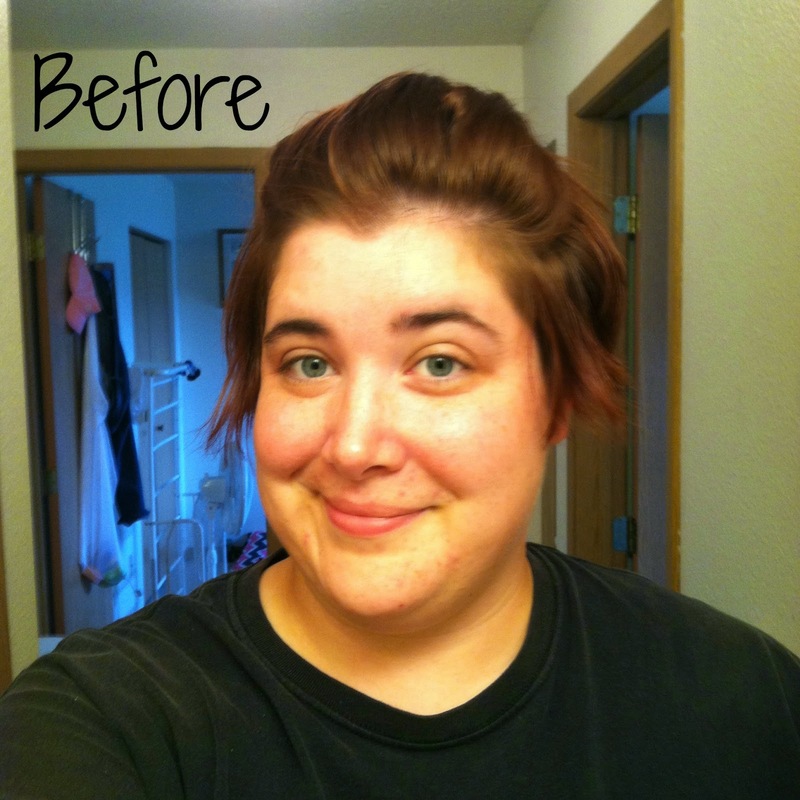 This product helps to create a smoother, younger look. Pores are XXS sized, as if they had 'snapped back' into shape, so that skin is tighter, smoother and younger. After exfoliating the skin, rinse and pat dry. Apply serum all over face morning and night to shrink pores. -wet on your nose with water. -remove water on your hand. detech film. -apply it on your nose. This unique pore mask is in the form of a syringe which contains gel-type ampoule for tightening enlarged pores and fighting against any blemishes on the nose and the cheeks, the most sensitive and oily part of your face. It’s different from other pore masks in that it’s actually a 20 minute long home therapy for a cleaner, more resilient complexion. Spread the ampoule over the included mask sheets and place it over your nose & cheeks area. You have to be patient for 30 minutes because the ampoule will react to your skin and may actually sting a bit like a real clinic therapy. Then remove the mask and rinse off. Overall I really like this box. It containes mostly full size products, and even the 23Years Old Pore Mask (the only sample size product in this box) contains enough product to use it twice. Everything was useful and an item I would repurchase. Price (as of date of review): $1 for 1 oz, $59.99 for 4 lbs, $119.99 for 10 lbs, or $469.96 for 4x10 lbs. My Thoughts: I absolutely love this dog food, and I think it makes a great addition to The Honest Kitchen family. Venus is always iffy on soft food, but she will always eat some Honest Kitchen. #GetNoticed with NEW Dial Coconut Water Refreshing Mango Body Wash! Welcome to the newest member of the Dial family, Coconut Water Refreshing Mango body wash! It contains coconut water and mango to give you clean, healthy, and hydrated skin and to give you a tropical escape right in your own shower. Coconut water is known to be rich in antioxidants and electrolytes that provide replenishing hydration to your skin, and mango is rich in nutrition while adding a hint of tropical freshness. This luxurious foamy body wash smells amazing. It cleans without drying, leaves the skin feeling soft and smooth, and also works as a bubble bath for the kids! 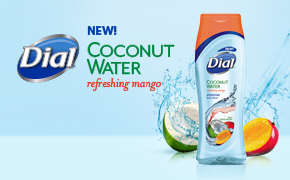 Dial has really mastered this product, and I can't wait to try more from the Coconut Water line now. I love this hydrating body wash so much, I want to share it with you! Leave a comment below to enter to win a coupon good for one free bottle of Coconut Water Refreshing Mango body wash (open to US residents only, age 18+). I will draw a winner from the comments below on September 9th. Leave a valid email address along with your comment so I can contact you if you win. August is often a busy time for families. Children are preparing to go back to school, while parents try to cram in last-minute activities to share with them before all the beautiful weather and free time is gone. In the midst of all this husstle and bustle, it can sometimes be easy to forget simple daily routines with the family pet. 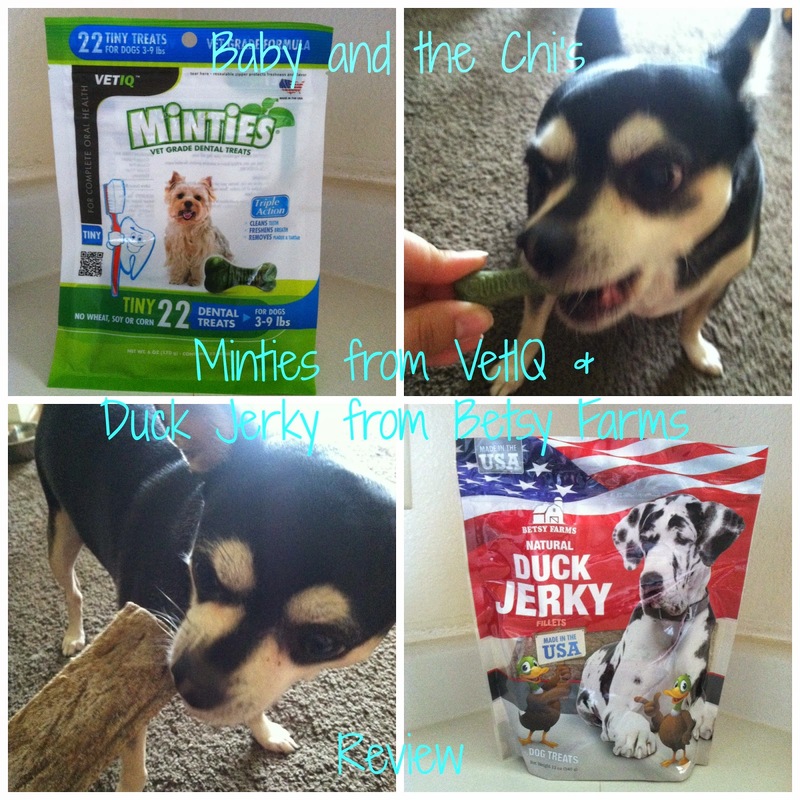 No longer do you need to feel like you've left your dog out of all the fun with some yummy jerky treats from Betsy Farms and Minties delicious dental treats from VetIQ. Taking the extra time to shop for healthy and natural treats for your precious pup can sometimes mean taking up time that you don't have when you're already busy this summer. That's why Betsy Farms has taken the guesswork out of their products for you. Our family received a bag of Natural Duck Jerky Fillets that are made in the USA. They are thicker than I expected, but chewy and easy for Venus to handle. An easy long-lasting treat for any pooch. Let's not forget about dental hygiene. Dog's teeth unfortunately seem to take the back burner when it comes to daily cares, but it honestly couldn't be any easier or faster for the on-the-go style of summer with Minties dental treats from VetIQ. Minties have a refreshing mint scent (and I assume flavor as well) that leaves your pets breath smelling sweet and clean. Minties also clean your dogs teeth just like a quick brushing would with their unique texture and formula, as well as working to remove plaque and tartar. These delicious and beneficial treats are made in the USA, contain no corn - wheat - or soy, and come in four different sizes depending on the weight of your dog. Not only are these a large part of Venus' daily dental routine, but she always comes back begging for more! Disclaimer: Baby and the Chi's blog received the product(s) mentioned in this post for the purpose of review and evaluation. Baby and the Chi's is not responsible for prize delivery. No monetary compensation was received for this post. Thi.s blog contains affiliate links. The opinions in this article are my own. I do not work for, or with, and brand mentioned in this article, nor do I have any official relationship with them. I have a relationship with GigaSavvy, for whom I create original editorial content. WARNING: THIS POST CONTAINS GRAPHIC AND OTHERWISE GROSS PICTURES OF MY FEET PEELING DURING THE PROCESS OF THIS MASK "DOING IT'S THING." YOU HAVE BEEN WARNED. IF YOU ARE EASILY GROSSED OUT, THIS IS NOT THE POST FOR YOU. This Foot Therapy mask was part of the Memebox, Hair and Body #2. Application: (Thursday) I was surprised at how little product was in the booties. It was very thin, but it was more than enough to saturate my feet once I had the booties on my feet. The smell of the "mask" was like depilatory cream mixed with isopropyl alcohol, but with a somewhat earthy undertone. The instructions directed me to leave the mask on for 1.5 hours, but I got caught up in another review and ended up leaving them on for 2 hours. The smell was really overpowering after the first half hour, and I was left with a headache for the rest of the day. It helped tremendously to place a fan next to my feet, and turn it on low, to blow the smell away from me. The mask itself felt very slick on my feet inside the booties, and made my feet cool and tingly. Day 1: (Friday) My feet feel very dry. They are covered in tiny wrinkles that make my feet look about 10 years older than the rest of me. I was afraid to apply lotion to my feet, for fear that it would delay the effects of the mask, so I soaked them in the tub for a while instead. No peeling or anything yet. Day 2: (Saturday) My feet are very dry and itchy. I seriously feel like I did when I was pregnant, and want to just rip my skin off. But I'm not a bawling emotional mess at the same time lol ;-) Anyway... yeah... My feet still have the "dry" fine wrinkles all over, but still no peeling. I hope this intense drying of my feet means it'll happen soon! Day 3: (Sunday) Let the peeling begin! Day : (Friday) I took a shower this morning and scrubbed my feet with a nail brush, and the remaining loose skin came off, and that was it. My skin felt dry, and needed a lot of extra moisturizing, but 8 days later, I have nice smooth feet!